Does anyone else feels the Chirurgeon role in the new book is kind of odd and out of place? There's just no staple 40K in there. Apart from the odd Dark Mechanicus experimenter or flesh grafter NPC the Chirurgeon is really not an archetype that we see a lot and fill a logical role in the 40K universe. Just not getting it why this needed to be included. Churigeons are the doctors of the system. There was no medical class in the base book of the first edition, there never really ended up being one. You can take medics (IG) and apothecaries (space marines) in table-top. In the Eisenhorn books the technology that keep the rich alive into their third century is mentioned. It's a perfectly reasonable role. To add to the above the Churigeons role can also be described as 'professional torturer' ...which sadly most Inquisitors find their talents often in demand (often to the point of being counterproductive). Also without a medic people tend to die faster in both life and 40k. ...Also you cant 'shoot the medic' if there is no medic to shoot! Did we need a medical class? It reminds me of the role as healer of the priest in Dungeons & Dragons game. It's not 40kish. Right, who needs medics in a world of constant warfare and strife? Obviously, there are medical personnel in the 40k universe that are not Mechanicus. It's called the Officio Medicae, and is a division of the Administratum. The fact that medical personnel doesn't crop up much outside of the roleplaying games is simply because the tabletop focuses on wargames and the like. You could just as well make the same argument about Adepts in general, or hell, Astropaths and Navigators. How often does the Navis Nobilite crop up outside of the roleplaying game? If nothing else, I feel that the Officio Medicae has been sorely neglected in background fluff relating to the roleplaying games, and they should likely have attachments to the Imperial Guard and be relevant to Acolytes everywhere, unless they want to depend on the man that wants to replace your arms with metal bits or a dodgy underhive doctor. Except it's not just a healer. It's a doctor. A very valid, very appropriate kind of character to play in a roleplaying game. Who would you expect would take care of the medical needs of a cell or squad? Not everyone wants to be healed by warp magic. I know Lynata played a sister of battle that actively refused aid from a psyker. Some people don't want healing from the local hive scum either who get medicae for some reason. If you want an example of a medic working for the Inquisition there was a doctor in the Ravenor books that worked for the cell for a little while. Also worth considering that a qualified doctor can do a whole lot more than just patch up bulletholes. They'd be a great asset for autopsies, chemical analysis, etc. Things that should come up pretty **** frequently in an investigation driven campaign. I was just about to write that. A skilled medic can go CSI: Askellon on a murder scene, warn the team that the decapitated body found in a shady location wasn't done in by a sword but by a precise burst of shuriken fire, and brew combat drugs, poisons and antidotes for the whole team. That is, when he simply isn't going to town with a chainsword. I know I harp on this a lot, but in fact, the condensation of skills post-Deathwatch has actually resulted in the funny situation where it's pretty much impossible to be a medical professional and not also a forensics expert and/or seasoned drug-dealer. Now I kinda want to play a character with Trade (Forencicist). The way I handle this, is that you need to have a matching scholastic lore skill or trade to use certain sub-skills. So no Chemistry use of medicae, if you dont have SL (chymistry), no autopsy without trade (mortifactor), no logic-decyphering without SL (cryptology) and no repairing with Tech-Use without CL (Tech) or even better trade (Technomat) for complex issues. This works quite well for our group. Medics have been in the Codex Imperial Guard for a couple of editions now. Apothecaries have been in Codex Space Marines since at least 2nd edition. Codex Witch Hunters actually includes a model specifically called Chirurgeon. I really don't see why you would think they aren't 40k-ish. 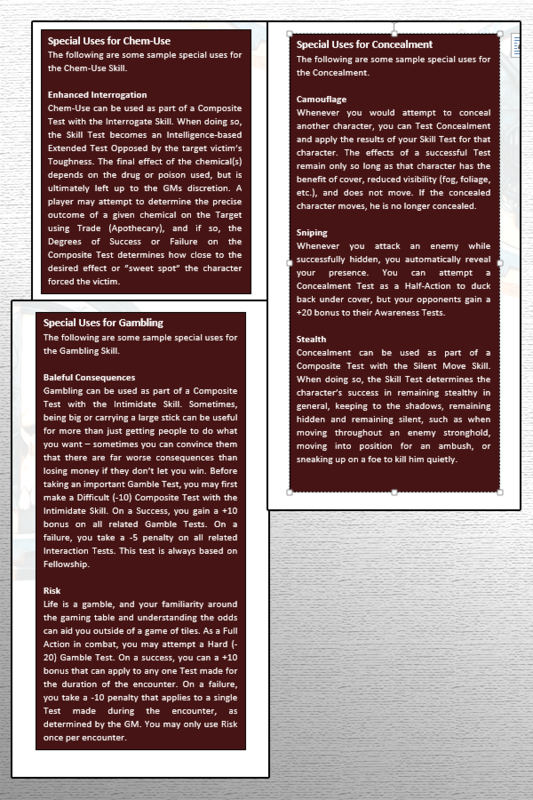 In my own system, I devised a system for "special uses" and added an additional way to use skills, called "Composite Skill Test". Cue a montage scene of me looking through the library that is the basement of my computer. When I get around to Medicae, I'm definitely going to do things like forensics. Also, I used Embalmeer instead of the Embalmer that is in DH1, but Mortifactor sounds way better. Some of the skill condensation was a really good idea, and I'll defend it to death. But some skills did become overly broad, and most notably, Trade skills became extremely narrow and redundant since Tech Use, Medicae and Survival took over as crafting skills. Paradoxically, this really steals the thunder from skill-based characters, because after a few ranks, almost anybody in the team can do all the things you do, even if less effectively. But wouldnt it help to introduce some prerequisites for sub-uses of a skill ? Lore skills or trades are perfect for this issue. They could limit the use of the sub-skill by their own level. Some? Definitely - Blather and Lip Reading, comes to mind. But nowhere near the end result. There's not even Perform skills anymore. Black Crusade, the only game line that allows you to remotely focus on Slaanesh removed Perform. It's mind-boggling. Exactly how I will eventually do it. To use one of the posted examples, if you want to do Enhanced Interrogation, you need both Chem-Use and Interrogation. But even if you have Interrogation +30, if your Chem-Use is at +10 (actually +20 in my system, due to a system of "Basic Plus" skills), you still only Test at +10. So let's say you have Concealment +10 and Move Silently +30. If you want to do a general Stealth Test, that's still just at +10. There's an argument that then it might be better to simply roll them separately, but one should remember that at that point, that's also the potential for failing twice. I think that might be quite a good rule to do it...I will try that. Two things words that should never go together: Chirugeon-interrogator. Well, keeping the tortured person alive was always the integral part of torturing people, and while it doesn't exactly take House M.D. to do that, a certain understanding of how the human body works is required. I think a rogue/heretical chirurgeon type would be a pretty nifty villain too. I think there's pretty much perfect items for doing exactly that in Black Crusade. Bonus on Medicae AND Interrogation? SOLD! Give him the mark of Nurgle for even more body horror! Any character that is focused on something other than combat is a very good thing. Dark Heresy should be an investigation specialists game shouldn't it?